Amardeep Singh: "Syuzhet for Dummies"
There’s been quite a bit of discussion of Matthew Jockers’ “Syuzhet”package since it was first released in February of this year. The discussion that I have seen has been entirely on scholarly blogs; I haven’t been to any DH conferences where this was discussed so I may have missed some threads. The blog posts I have read about this, however, are remarkably smart, thoughtful, and respectful. When we talked about Syuzhet in class in our DH class this past week, one of my students noted that if this same back-and-forth had taken place in scholarly journals it would have taken years to have the conversation play out. So: score one for scholarly blog conversation. My goal here is *not* to add anything substantive or new to the discussion (besides a few graphs from six George Eliot novels below), but rather to describe my own learning curve and give others (including students) a few tips as to how to do things in order to play around further. In short, "Syuzhet for Dummies" -- where by "dummies" I mean "smart readers of literature who have simply never had any reason in the past to mess around with code." I’ll start with a brief summary of the scholarly debate about Jockers’ work and method as I understand it, and then give readers a step-by-step account of how to emulate the process of using the R programming language in order to apply them to other texts. A basic point or two that it took me at least a little while to comprehend. First, Jockers is not inventing the idea of sentiment analysis out of the blue. He is borrowing the algorithms for analyzing sentences from four separate processes that have been developed to do that (some of them were, in fact, originally intended by the academics who made them to scrape Twitter in order to ascertain consumer responses to commercial products in the marketplace). Algorithms like the Bing algorithm (named after CS professor Bing Liu, not Microsoft's "Bing") are derived from a dictionary-based method where a lexicon of words has assigned sentiment values (presumably a word like “adore” would have a positive sentiment value, while a word like “detest” would have a negative one). The “Stanford” natural language processing method is more complex; they have used computational linguistics to diagram whole sentences and plot their sentiment arc. This ought to be a more sophisticated and accurate way of reading the sentiment of individual sentences, but in a subsequent test, Jockers decided that the Stanford method actually corresponds less well than dictionary-based methods like Bing to his own, hand-tagged reading of a large but limited set of trial sentences (the entire text of Joyce's Portrait of the Artist as a Young Man!). In most of his blog posts on Sentiment Analysis, Jockers bases his examples on the Bing algorithm. Next, read Annie Swafford’s first critique here (there are several). There are two prongs of the critique, one mathematical (do these sentiment-processing algorithms read the emotional valence of individual sentences correctly? ), and the other oriented to the method by which Jockers creates his rather astonishing visualizations of novels. Jockers responds to the mathematical questions Swafford raises by arguing that while dictionary-based algorithms do indeed have the potential to misread individual sentences, most times in traditional literary works ambiguous sentences will be surrounded by contextual sentences that clarify the mood. On average, Jockers suggests, the algorithms do a pretty good job finding the average sentiment of larger chunks of text, while they might indeed be prone to misread very small samples. On the visualization question, the most damning point Swafford makes is that Jockers’ beautiful, hyper-simplified sentiment graphs are based on a method (Fourier Transformation + a low pass filter) that is likely to introduce false artifacts upon visualization (she calls them "ringing artifacts"). So the problem isn't that these diagrams are too clean and simplified to be useful, the problem is in fact that they might not be true to the text. Jockers initially pushed back against Swafford (and other critics who made arguments similar to hers). But in April, in a blog post called “Requiem for a Low Pass Filter,” he changed his mind about the Fourier transformation he had been using and advocating. In effect, he acknowledged that the beautiful “foundation shapes” he had been hoping to use his “Syuzhet” package to create (and allow others to create) gives us images that are actually too distorted to trust. All we have is an R package, syuzhet, which does something I would call exploratory data analysis. And it’s hard to evaluate exploratory data analysis in the absence of a specific argument. The key phrase for me is "exploratory." These methods lead to visualizations that might or might not be interesting; they might or might not tell us something new about novels we (presumably) have already read. I personally am not interested in using these techniques to move categorically towards a "distant reading" paradigm, nor do I think they give us any kind of fundamental truths about literary texts that supersedes understanding derived from actually reading them. At best, these methods piggyback on my existing close reading habits in a kind of hybrid formation. I take all of this with a grain of salt; it's still pretty fascinating. Before we start, keep in mind that what we are doing here is already considered somewhat “obsolete” in the sense that Jockers has acknowledged that the Fourier transformation function he built into his package might introduce more problems than it solves. As of his last blog post on the subject, Jockers had embraced a different approach to transforming data (for me, that’s going to be the next thing I attempt to try, though figuring out how to apply the "Loess" filter is beyond the scope of this blog post). That said, also keep in mind that all of this is meant to be exploratory. If we turn George Eliot’s novels into “sentiment vectors,” and then attempt to visualize that, what do we get? I would not present these images as the “truth” of Eliot’s plots. Rather, the question I would ask might be this. Given our experience having read Eliot’s novels closely, do these images show us anything we might not already have known? The R Studio version has some features that make it easier to use than other versions of R (including the R GUI version you can get from the CRAN website). In particular, it is easier to install packages in R Studio than in R GUI. The first thing you need to do once you have R up and running is install Jockers’ “Syuzhet” package. In R Studio, all you have to do is click on "Packages" and then on "Install Packages." You'll have to set a mirror (meaning, the server from which you are actually downloading the files), and R Studio should do the rest. 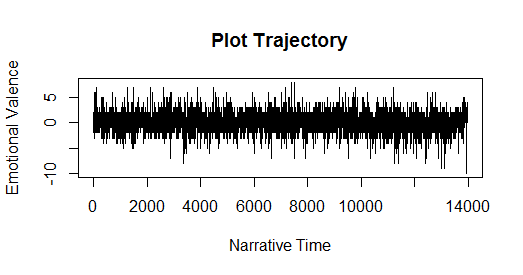 This brings the text of the file into working memory in R as an object called "middlemarch" from the root directory on my hard drive. From this point on you don’t need to mess with traditional file names on your computer. (FYI It took me a while to get R to like the way I specified filenames. Note the forward slash!) If you have your text file located somewhere else on your computer, you’ll have to figure out the exact path (which in current Windows is sometimes a little tricky). And if you are on a Mac, you’re a bit on your own on this part, sorry. Hint: if you’re doing a novel that has more than one word in the title, use underscore marks to separate words rather than spaces, and aim for abbreviated versions to keep things simple and reduce the likelihood of typos. Instead of tess_of_the_durvebilles, just call it tess. The “get_sentences” function parses the text file into a string of sentences, which needs to happen before you can create a vector (a mathematical interpretation of the file). “s_v” is the sentence information rendered into something mathematical we can use in the next step. This should create a new vector, corresponding to the sentiment values. On the “Vignette” page linked to above, and in Jockers’ various blog posts, he has indicated that in fact there are three other method choices you can try here (including the Stanford NLP method). “Bing” is named after the researcher (of Chinese descent!) who created it, not something associated with Microsoft. 4. Making a noisy graph! If everything worked the way it was supposed to, we should now see a noisy graph that looks like the image below. If you are getting errors, most likely it’s because you have a quotation mark in the wrong place. Also note that there’s no space after the command “Plot”. 5. Making a smoothed out / low pass filter image. Again, there’s much discussion of the Fourier transformation and the low pass filter Jockers set up in his package that leads to these pretty sinusoidal pictures. Bearing that in mind, we still want to see what it looks like for our particular novel, do we not?